1.1 Why is There Still Confusion About Google’s Birthday? 1.2 How Does Google Celebrate Its Birthday? 1.3 The Google Birthday Surprise Spinner. The question may seem like it should have a definitive answer, yet, in reality, it is a surprisingly difficult question to answer. This is partly because the question of what constitutes Google’s birth throws up multiple dates, but also because the company itself has shifted its birthday around several times. Google’s founders, Larry Page and Sergey Brin, first met back in 1995 and began work on a search engine project in January 1996. To some, this means that January 1996 is the origin date of Google. However, at that point, the search engine project they were working on was called BackRub. The Google name did not come about until 1997, which is the year the Google.com domain name was first registered. For this reason, some consider 1997 to be the origin of Google. Yet, the company did not officially open for business until September 1998. Officially, Google cites its incorporation date as September 4, 1998. It is generally accepted that, in terms of years, Google’s history should be measured from its incorporation in 1998, rather than the birth of the initial search engine project, or the registration of the Google domain name. However, the precise date in 1998 remains an issue of contention. Despite the incorporation date of September 4 seeming like a perfectly logical starting point for the company, since 2006, Google has celebrated its birthday on its homepage on September 27 each year instead. Why is There Still Confusion About Google’s Birthday? Aside from the aforementioned issue of determining exactly when the company began, part of the reason why confusion remains about exactly when Google celebrates its birthday is because the company itself has not been consistent. Indeed, while September 27 has been the chosen date recently, various other dates have been used. The first time the company publicly celebrated its birthday was in 2002. To mark the occasion, the logo on the website was altered – something which has become known as the ‘Google Doodle’ – and this was done on September 27. This is likely the reason why the company has settled on that particular date now. However, in 2003, Google celebrated its birthday on September 8, while in 2004, the birthday celebrations occurred on September 7. A year later, the company opted for September 26 instead. None of these dates appear to have a lot of relevance, although some have suggested that September 7, 1998 was the day Google truly ‘opened for business’ after becoming incorporated a few days earlier. In 2013, Google made reference to the confusion surrounding its birthday, admitting that it had celebrated on four different dates. There does not appear to be any real consensus on why September 27 has emerged as the accepted birthday for Google, although it has been suggested that the company may have felt some of the earlier dates in September were too close to the anniversary of the September 11, 2001 terrorist attacks on the World Trade Center. Regardless, while many would argue that Google’s official birthday falls on September 4, the accepted and established birthday now appears to be September 27. How Does Google Celebrate Its Birthday? Since its fourth birthday back in 2002, the company has celebrated publicly each year through the use of what has become known as a ‘Google Doodle’. Essentially, this means that on Google’s birthday, the logo on the Google homepage is physically altered in some way to mark the occasion. In 2011, for instance, the word ‘Google’ was arranged around a table, recreating a typical birthday scene. The table had a birthday cake on it, and some of the letters in the logo had party hats added to them. Over the course of subsequent years, the birthday Google Doodle has sometimes been animated and, more recently, has been interactive. In 2016, the Doodle was an animation of the letter ‘G’ arranging balloons to spell out the remainder of the word ‘Google’. For 2017, some of the letters in ‘Google’ were arranged to look like balloons, while the second ‘O’ was turned into an interactive spinner, allowing users to select a range of browser games. Interestingly, Google does not only celebrate its own birthday. If you register for a Google account and fill out your personal information within the account setup, the website will display a special Doodle on your birthday each year. The Google Birthday Surprise Spinner. 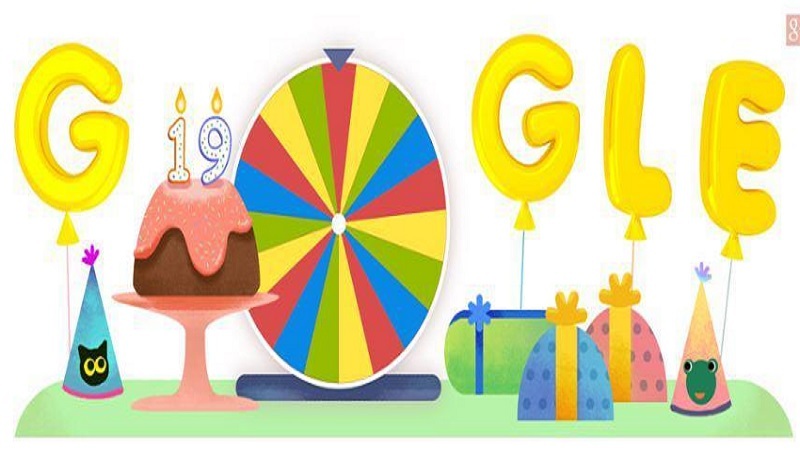 In 2017 also introduced the very popular “Google Birthday Surprise Spinner” game, which lets you play the best Doodles from the last 19 years. This “meta-Doodle” lets users use a game spinner to randomly choose which Doodle to play, including games like Pac-Man, Snake, Cricket Cricket, DJing, Birthday Pinata, Scoville Scales, Theramin and others. To use the Google Birthday Surprise Spinner, simply visit Google’s homepage, and type in “Google Birthday Surprise Spinner” and click search. The spinner will appear in your browser.